HE R ST ORY Our mission: Empowering, employing & educating women in Uganda. This revenue allows us to grow our impact in Uganda. 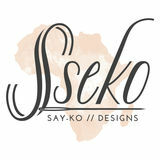 Sseko sandals & accessories are handmade by women in Uganda. In addition to Sseko sandals, we partner with artisans to create exquisite products, jobs, and economic opportunity across East Africa. HELLO Just a few short years ago, Sseko was headquartered under a mango tree in rural Uganda. We were four young women, making sandals and dreaming about what the future held. Weâ&#x20AC;&#x2122;re now a family of over 50 women from all walks of life. Together, we make beautiful things. We laugh and we love and we dance and we learn. And through the making and selling of beautiful products, incredibly bright, passionate young women are able to continue their educations and chase their dreams. We love to dream about the futures for these women--about the change they will bring and the love they will give. But we love dreaming about the here, as well-- about building a community of people who have the courage and audacity to dream about and work towards a more beautiful world. You see, every sandal has a story. THE RIBBON SANDAL COLLECTION THE RIBBON SANDAL IS COMPOSED OF A H A N D C R A F T E D L E AT H E R BASE AND COMES WITH A PA I R O F H A N D M A DE RIBBONS. THE T-STRAP SANDAL COLLECTION From rooftop parties to wandering the rocky shores of Santorini, the leather T-Strap Sandals will be your trusty and stylish warm-weather adventuring companion. With a stationary leather t-strap and an adjustable buckle at the ankle, you can easily slip into them when youâ&#x20AC;&#x2122;re on the run. The best part? The accents are interchangeable! A sandal for everyday, with accents for every style and occasion! THE ACCENT LOAFER The Accent Loafer is the same gorgeous oil-tanned leather as the classic loafer but can be customized with interchangeable accents that set these classy kicks apart from the crowd. A shoe for everyday, with accents for every style! Crafted in Ethiopia from the finest leathers, this versatile, timeless flat will soon become a well-loved staple. Available in suede, distressed gold and oil-tanned finishes, this sophisticated shoe will add the perfect handcrafted polish to your look. THE BRASS BANGLE COLLECTION Itâ&#x20AC;&#x2122;s true what they say, not everything that glitters is gold. These brass bangles are exquisitely handcrafted in Ethiopia and will tell the tales of your own story while also reminding you of the stories of Sseko artisans in Uganda. By wearing the name of a Sseko woman, the wearer is reminded of the life and story of another woman, a million miles away, whose life may not be all that different from her own. These bangles represents the global community of strong, loving women that we are all a part of--women who continually inspire one another with courage and with grace. Know her story, share her story and take one small step towards a brighter future for each of us. THE BUCKET BAG The Sseko Bucket Bag is the ultimate carryall, handcrafted from Ethiopian suede or oil tanned leather. With a simple, sophisticated shape, this classic bag has plenty of room for all your essentials. From your trusty laptop to that novel you canâ&#x20AC;&#x2122;t put down, now you just have to decide...what will you be carrying in this slouchy stunner? THE CROSSBODY CLUTCH The Convertible Crossbody bag is handcrafted from the softest sheepskin leather. From a crossbody to a clutch, this versatile bag with removable straps can be worn in three ways. Available in rich hues accented with brushed gold hardware, this classy bag will take you from day to night and season to season, you class act, you. THE MOON CLUTCH The Sseko Moon Clutches are perfect for keeping your pretty little things organized while youâ&#x20AC;&#x2122;re on the go, as you usually are. The Moon Clutches come in three sizes: from a perfectly petite pouch for your credit cards and cash to a roomy clutch for all your essentials. THE WALLET COLLECTION This wallet collection is handcrafted in Ethiopia from natural leather. These are sure to keep you organized (and chic!) on your next grand adventure. THE TOTE COLLECTION The Sseko Leather tote is handcrafted by artisans in Kenya from oil-tanned leather. Whether youâ&#x20AC;&#x2122;re adventuring across the world or just to the office, this classic tote, with all itâ&#x20AC;&#x2122;s pockets and compartments, is the ultimate travel companion. And just like you, it will become more beautiful and storied with every passing day. The Sseko Accent tote is a classic wardrobe staple with the addition of interchangeable accents so this spacious bag can be updated with whatever accent suits your mood. One bag, endless possibilities! The upcoming Spring 2015 collection.